Read – I’ve lost count of the number of times I’ve read The Paper Dolls by Julia Donaldson (of Gruffalo fame) this week. Have you read it to your little ones? It’s such a lovely book, and has been the only thing, combined with cuddles, that has helped my little snotmonster feel better. Watched – My wallow tv of the week was Wanted Down Under. Seriously, someone needs to come and take my remote control away when I turn to that. Basically it’s just a vehicle for my tears. All that sunshine and beachy lifestyle. Then they show the sequence at the end where the family see a video from their family back home and I’m programmed to sob. So while I can’t say I have loved watching it, it was necessary wallow tv. Next week – NO Wanted Down Under. Wore – I slicked on a coat of this red nail polish today. It’s called Downtown Red and when I wear it I feel a bit like Melanie Griffith in Working Girl. It’s got attitude for sure. Occasionally I catch a glimpse of my nails though and think serial killer. Was there a film where a serial killer collected women’s fingers? Grim. I’d better work out how to run in my 80’s heels. 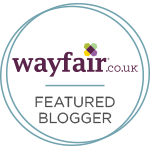 Heard – I’ve been listening to Nick Mulvey, loudly, very loudly. Sparked by hearing his new track, Cucurucu. Isn’t it awesome? Made – Knit Camp finishes today. A month of learning to knit and I am still on the first project, not quite finished even. 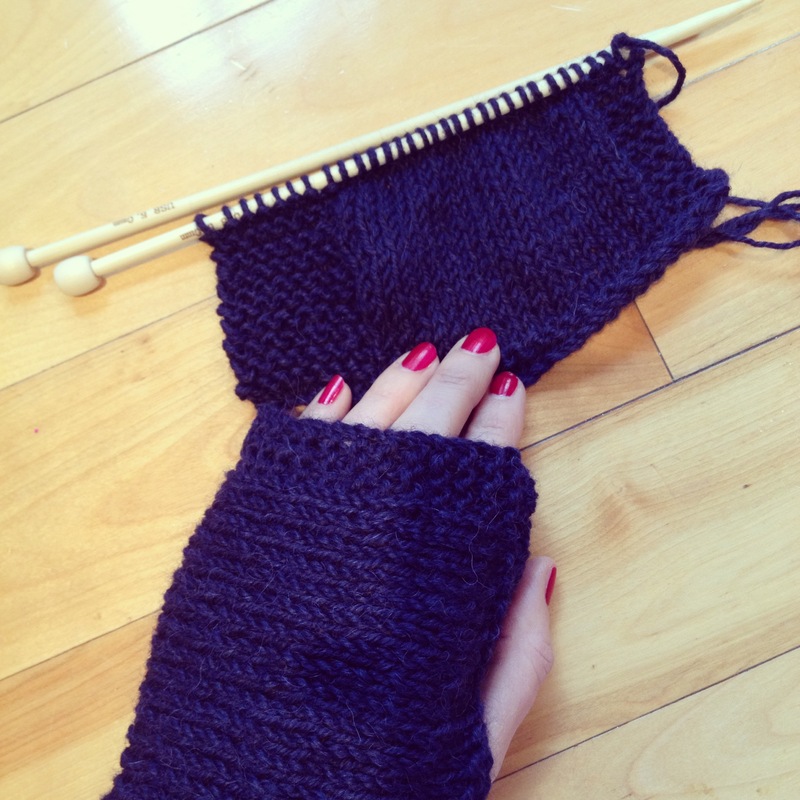 I have one baggy handwarmer and am halfway through it’s tighter, neater match – see pic above! I’ve been very slowly knit, purl, knit, purl, knitting. Clackety clack. 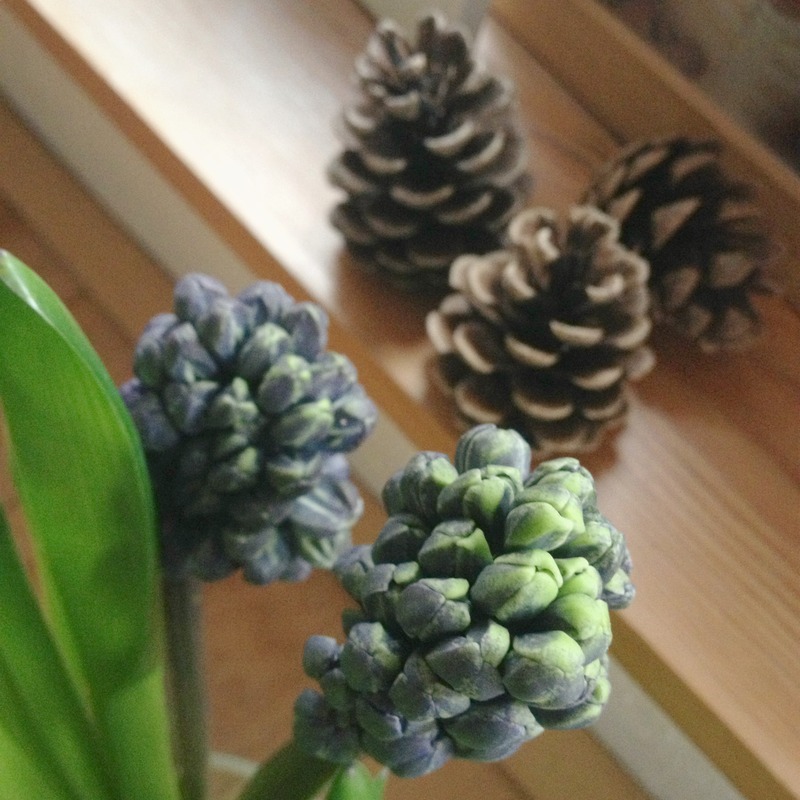 and lastly… Loving new flower Friday and these hyacinths. Can’t wait for them to sweetly scent the week ahead. Aw, thank you. I might need to pick up the pace if I ever want to finish them! Knitting calls for such concentration! Lovely little things. Your nails look so pretty! I need to get bolder with my nails, not just the sheer pink “French manicure” polish i usually use. The red is bold but chips in about a day of normal family life 🙂 I’ve already returned my nails to a pale mauve that doesn’t look so shocking when it’s got the odd chip. You should go red for at least a day though! Listening to Nick Mulvey as I type this comment, not heard of him before, so really pleased you’ve introduced me to him. The nail colour is great, and I think you’re doing a great job with the handwarmers. Knitting is a lot harder than it looks. That first picture is just adorable. 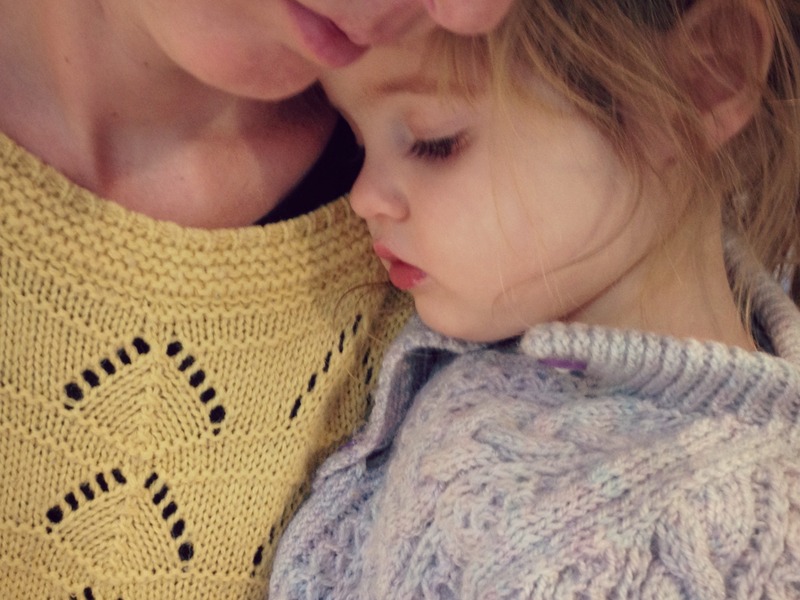 We’ve had lots of snot and cuddles this week too. Must check out that book, I’m always looking to add to our Julia Donaldson collection. I had some hyacinths last week that smelled divine, I’m going to have to get more to replace them – they are just so lovely. Great track, I’ve not heard of Nick Mulvey before. Going to head on over to Spotify to see if he’s on there. The Nail colour is fab! It looks like you’re doing well with your handwarmers too! Thank you. Knitting is SO hard! Haven’t picked it up for a few days now, must get back to it soon.